Join "The Knave" and Sir Walter on a wild tale of mistaken identity, kidnapping, bowling, and a rug that, in faith, really tied the room together - in a sidesplitting Shakespearean comedy of errors and ninepins, told in five glorious acts of iambic pentameter and impeccable period prose. William Shakespeare's Star Wars will astound and edify Rebels and Imperials alike. Zounds! 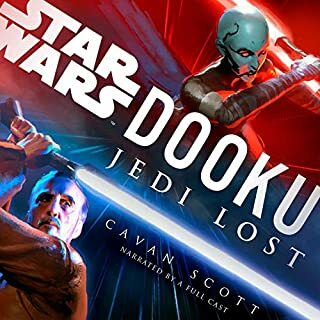 This is the audiobook you're looking for. I had a blast reading the book. Now to hear it performed, it's even better. Mashups like this usually don't impress me because most don't go for broke and waste time winking at themselves. This... this is greatness incarnate, and I daresay the Bard would approve. A full cast of pros playing it straight and yet still coming across with a Monty Python edge, the classic sound effects and music... it's comedy gold. I can't imagine how many times they had to stop recording in the attempt to not bust a gut. I haven't laughed this hard in ages, and I think I spooked my co-workers this morning. Perhaps to tell a greater truth. What made the experience of listening to William Shakespeare's Star Wars the most enjoyable? Hearing the asides from R2-D2. I have wondered for 30 years what that little rustbucket has been saying, and I found out. I nearly drove off the road doing so, but I found out. What was one of the most memorable moments of William Shakespeare's Star Wars? The aside from Obi-Wan Kenobi in the first act. When you hear it, you will understand. Daniel Davis filled the role of Narrator perfectly, despite my misgivings at the beginning that Star Wars (of all things) didn't need one. The Shakespearean stage directions were fun. I have been saying 'Exeunt Droid' for three days, much to my wife's chagrin. Yes, if I had been presented the opportunity, I would have. Probably best that I didn't. It might have killed me. If you could sum up William Shakespeare's Star Wars in three words, what would they be? The author must have seriously considered the question when he sat down to write. Could a Star Wars book work in Shakespearean English? Should I even waste the time trying? I, for one, am glad Ian Doescher decided to do it, because it's GREAT! The characters have their own thoughts revealed in ways they aren't done in the movie, which leads to a twisted understanding of characters like R2-D2; apparently, he's not a happy-go-lucky droid: he's conniving and manipulative, even if it is for the better good. The narrators did a great job with the character voices, and some of them got the intonation just right, despite the fact that they were speaking in Shakespeare-era English. 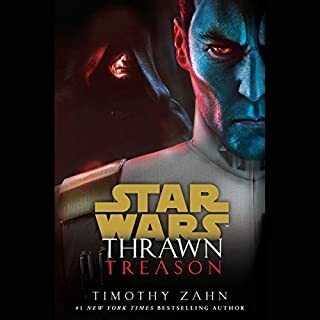 As both a Shakespeare fan and a Star Wars junkie, I'm excited to share this one with my kids, in the hopes that it will get them interested in the Bard before they have to read his real stuff in junior high! This was really fantastic. The narrators of all the Star Wars audiobooks came together to perform William Shakespeare's Star Wars, and it was the best thing ever. At first I was meh on it, but carrying on, I soon to grow to love this performance. Ian Doescher poked so much fun into the Star Wars film in the form of Shakespeare (the "Han shot first" scene among others) that I couldn't help but laugh really hard in public. Though only about 3.5 hours, it is worth EVERYTHING SECOND & CREDIT for it. I can't wait for "The Empire Striketh Back." 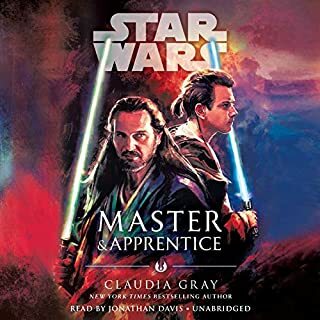 Where does William Shakespeare's Star Wars rank among all the audiobooks you’ve listened to so far? 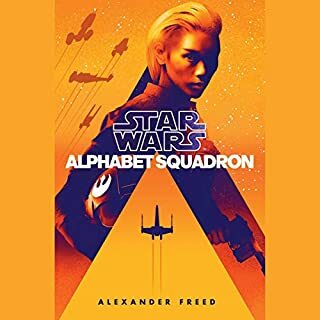 For a super fan of Star Wars, this is the best purchase I have ever made from Audible. It followed the original storyline but had a little bit more humor. 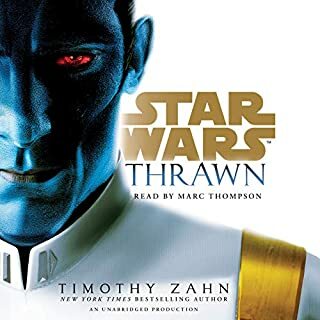 The narrators were awesome, especially Marc Thompson (who does Han Solo's voice). Hearing Han Solo do William Shakespeare was hilarious! Moved? No, not really. Just very enjoyable. I will listen to these three books over and over and over!!! In short, this is the most brilliant piece of writing I have read in a long time. I am a big fan of the original trilogy Star Wars movies and it’s just incredible how well they work in Shakespearean language. Doescher studied Shakespeare and is also a big sci-fi geek and his understanding of both media comes across very well. The dichotomy of the sci-fi content in old fashioned language adds a real interest to the writing. It’s also a heck of a lot of fun to play “spot the (adapted) Shakespeare quotation.” For example, we have “Alas, poor stormtrooper, I knew ye not” referencing Hamlet’s thoughts on Yorrick. 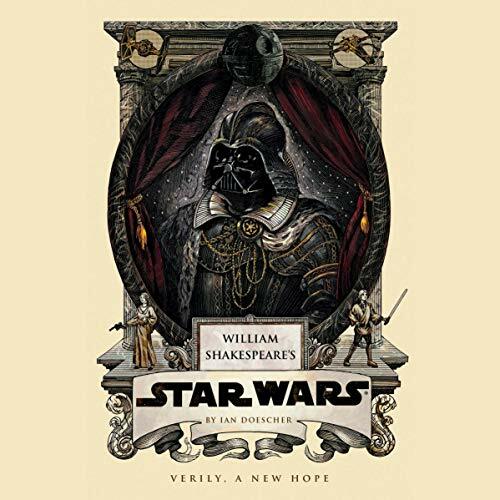 I have both the audiobook (narrated by a troupe of Shakespearean actors including the author himself) and I strongly recommend experiencing William Shakespeare’s Star Wars in audiobook format rather than the written word. The cast really brings it to life. What did you love best about William Shakespeare's Star Wars? a fun and exciting romp in the stars with the bard! the ONLY detractor to the book is R2-D2 saying beep and boop. the story would have lost nothing if the sound effects of his speech had been added. still and absolutely fan-freaking-tastic I hope that empire and Jedi are soon to follow!! I have enjoyed this performance more than times. I am looking forward to the prequels. Ben Kenobi. 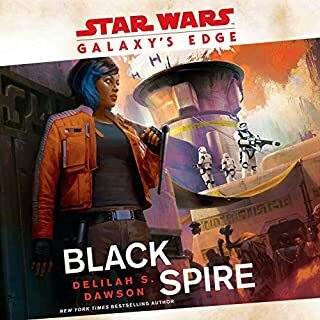 His rewritten diolog was the most fun to compare to the original and the small retcons added are a good way of tying the series together in a more believable fashion. The scenes with Like on Tatooine. the slow, character based scenes work particularly well in the Shakespearean format. It filled me the same excitement that Star wars used to give me as a boy. I'm so glad this exists. I'd never have thought of it but the two things work so well together. A great retelling of the Star wars story! I look forward to the next audiobook! better than the original script?? fantastic performance of a great adaptation. The space battle on stage is a work of genius.. though the Battle of Hoth is a close 2nd.. but that's another story.. I can not believe how well Star Wars and Shakespeare work together. I'll love to see on the stage. Thoroughly entertaining from Tatooine to the Death Star. The characters portrayed are almost all spot on (perhaps a little too much John Wayne in Han Solo), but that's a minor quibble. I look forward to the next episode. This has been my first experience of audible and my eyes are grateful for the rest. Excellent. I love Shakespeare and I love Star Wars so how could this not be a good thing! Performances are great with a bit more insight into the mind of R2D2. LOVED IT! Would you listen to William Shakespeare's Star Wars again? Why? Deifnitiely, I will listen to this many times. Ian doescher has done a truly magical thing here. He has taken this book and kept it completely faithful while transforming it into a Shakesperian play. The voice actors are great and I cant wait to start the next. This is such a famous story and so many will know it "line for line" already so it's hard fopr voice actors to bring anything new to the story at all. Having said that they do..... They use the new syntax to bring out the emotions of the story in vbery different ways... you lkearn more of Moff Tarkin and his motivations and feelings for example. Would have but just couldn't take the time out... maybe my next listen. There are so many "Star Wars Geeks" out there (me included) and any adaptation runs the risk of not meeting the high expectations of such a strange and devoted following. George Lucas even fell foul of this with some of his decisions for Episodes 1,2 & 3. Certainly among many fans, episodes 4,5 & 6 are held in such high esteem that any "tampering" with them could lead to disaster!I am in this category, and was at first a little cautious when I heard about these books. I got the paper version first (a box set of hard backs) and thoroughly loved them. Then I saw them in Audible and listened to the narration sample. I was sold.....My only recommendation is this... FANTASTIC....GET IT ...! Both as a concept and how this then works out in practice it is brilliant. The more one knows about Star Wars and about Shakespeare, the bigger the laughs. Excellently done. It is good to have some light hearted pieces to listen to occasionally. I hope the same people do some more of the same.